Aside from quoting directly from the Wikipedia, I used primarily as mentioned the following articles: "Me To Your Leader Take" by Richard Ellington in All in Color for a Dime and Lou Mougin 's "Weird Adventures on Other Worlds, Planet Comics: The Universe of the Future" in CBM 60. To be honest, re-reading Ellington's piece was a let-down as the author isn't "bullish" about the series and it's plain weird for a nostalgic article. In the end, I ended up liking Mougin's (reviled as he is because of his guesses on the GCD) article better. The same ground is covered but 1) with more details about the issue numbers and 2) with artists ID that Ellington didn't have. Plus the CBM piece is illustrated! I'd say your best bet is to find yourself a copy of CBM 60 but be aware it only deals with the Planet run. Because Fiction House didn't have any resident super-hero less overall has been written about their output. CBM 106 has a Ron Goulart article covering the "History of GGA" and devotes quite a bit of time to Fiction House. Here's another classic character and artist to cover about whom a lot has been written and analyzed. I'll try to keep it brief and refer mainly to two online biography and the Toonopedia entry about Pogo. Walter Kelly (25/8/1913 - 18/10/1973) was born in Philadelphia. When he was two, his family moved to Bridgeport, Connecticut, where his father worked in munition factories. His father also was a theatrical scenery painter and taught the boy how to draw. In his teen Kelly suffered for two years of a paralysis that affected his left side. In high school Kelly edited the school magazine and also drew for the local paper, the Bridgeport Post. Especially Mutt and Jeff inspired him. After graduation in 1930 he worked as a journalist and cartoonist at the Post. He worked at almost every job in the art and editorial departments and eventually he drew editorial cartoons. For a short time he was an investigator for the Bridgeport Welfare Department and studied art in New York. Kelly had fallen in love while in New York, but the object of his affection was transferred to Los Angeles. Shortly after Kelly followed. His drawing talent led him to start work for Disney in 1936. He worked in various departments and eventually ended up in animation where he worked among others on Dumbo, Snow White, The Reluctant Dragon and Fantasia. It is almost certainly his experience with this sort of assembly-line, routine work that enabled Kelly to produce a strip like Pogo with as much clarity and consistency as he did. However, it is this assembly-line aspect that Kelly disliked about the job. Though it seems he had no complaints against the Disney corporation, when a labor strike came about, Kelly used this as an excuse to move on. After this Kelly and the woman he followed to Los Angeles, now his wife, moved back to Connecticut and Kelly again started doing freelance work in New York. In 1941 he returned to east and did comic book work for Western Printing & Litographing. Editor Oskar Lebeck hired him to write and draw stories for Animal Comics, Our Gang, Fairy Tale Parade, Raggedy Ann & Andy, and Santa Claus Funnies. He drew covers for a number of Disney titles, whose interior stories were sometimes produced by Carl Barks, the most celebrated artist behind Donald Duck. 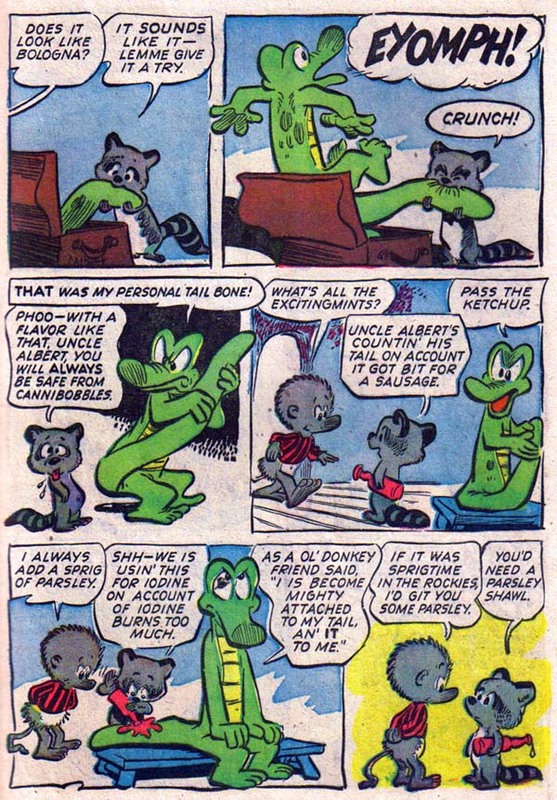 In 1943 Kelly created Bumbazine and Albert the Alligator, which appeared in issue number one of Animal Comics. Its story, called 'Albert Takes the Cake', was the basis for Pogo, and started "Once there was a big old alligator named Albert who loved chocolate cake..." The cartoon depicted the adventures of Bumbazine, the black little boy of the title, who lived in the Okefenokee swamp in the company of his pet alligator. Gradually Bumbazine faded out of the strip and because, as Kelly put it, “being human, he wasn’t believable”. Kelly had rheumatic fever as a child and was unable to serve in active duty, but still tried to do something to help the war effort and did illustrations for dictionaries and language guidebooks for the U.S. Army at the Foreign Language Unit. It was during his time that he spent time with journalists at the Bridgeport Post, one of whom suggested that Kelly should try producing gag cartoons. Then, in 1948 Kelly started work for the New York Star, an independently funded newspaper, as the art director. This position led to him doing some editorial cartoons for the paper. The editorial cartoons led to him producing a daily strip featuring Pogo. In it the denizens of the swamp held their own election that was almost as garbled and surprising as the presidential contest between Truman and Dewey. In 1949 The Star, being independently funded and having political leanings, went under. Luckily for Kelly and the rest of us Pogo was the first strip on the Hall syndicate. The syndicated Pogo began on May 16, 1949. Pogo started out slowly in syndication but in the late 1950s it was subscribed by almost 600 newspapers. For the next six years Pogo was available simultaneously in comic books and newspapers. In 1952 Kelly was named "cartoonist of the year". A mock presidential bid by Pogo grew into literary event when the writer Carl Sandburg proclaimed "I Go Pogo!" Two years later Kelly was elected president of the National Cartoonist Society. By 1954, his relationship with the publishing company had soured, prompting him to quit doing books and concentrate on strips. In the 1960s Kelly had health problems and he left more and more of the drawing to others. He regularly reprinted Pogo, resulting in more than three dozen paperbacks during his lifetime. In 1969 a Pogo animated cartoon was shown on TV. Kelly died in Hollywood on October 18, 1973, of complications of diabetes. He had recently had a leg amputated." My favorite cartoonist of all time! "Why, you goggle-gaited ol' gull!" Who else would turn a phrase like that? 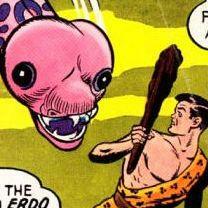 I'm reading some ca 1960 Pogo reprints now -- wonderful stuff. That back page seems really off-model. I wonder whether Kelly did layouts only or it was all by assistants. No mention of Kelly working on New Comics #1 for DC. Odd. Thanks for the post though! Cool stuff! I know he did work for New Comics. I even posted some of those Gulliver's Travel scans as requested by Jack. I only wanted to concentrate on the Pogo material here. I didn't know you penned that. The reason I commented was that in every article or bio of Kelly I have read, they jump from NY to Disney. I haven't seen the mention of the time at DC anywhere. To that I'll quickly agree: I found it odd after we were recently talking about his early work for DC not to see it mentioned elsewhere (and you're right, I didn't pen that, I simply edited several sources). I had it in my mind but didn't put it down. It fits though with his brief period in New York before going out West. Still, something else was buggin me: the dates don't seem to match, do they? When were the DC pages published: 1937? And the online sources have him leave for the West Coast in 1936. There seems to be some inconsistency here. Maybe one of our resident Kelly expert can shed a light on this. We're catching the other title in which Plastic Man made his name after Plastic Man disappeared from the book. Starting with issue # 103 (Dec. 1950), Police Comics switched to a Crime / Detective anthology book starring Ken Shannon on all the covers. Ken Shannon later earned his own title which was already covered in the thread. Another popular feature in this anthology was T-Man whose solo series lasted much longer than Ken Shannon did. I will reserve discussions of T-Man and his "universe" to its later entry. "Jane Arden was an internationally syndicated daily newspaper comic strip printed between 1927 and 1968. 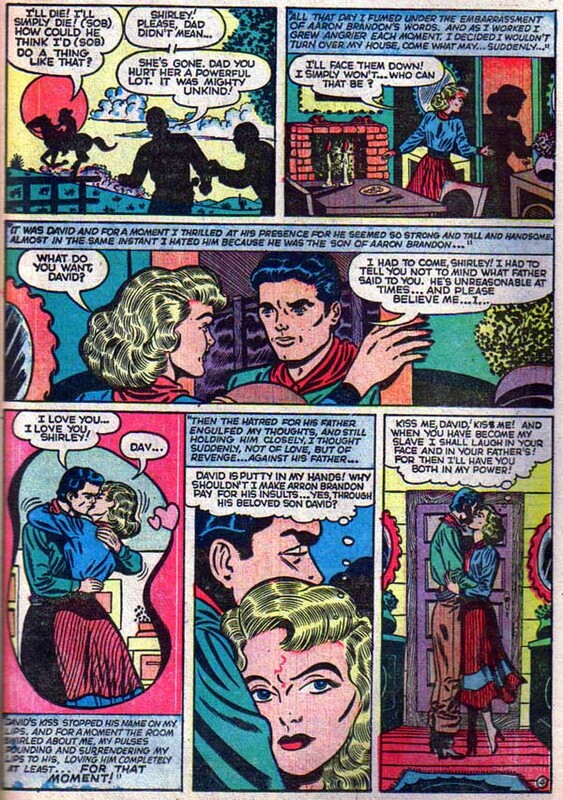 The title character was the original "spunky girl reporter," actively seeking to infiltrate and expose criminal activity rather than just report on its consequences, and so served as a prototype for later characters such as Superman supporting character Lois Lane and fellow comic strip heroine, Brenda Starr. Jane Arden was only moderately successful in the United States, but was highly popular in Canada and Australia. The strip was widely reprinted in comic books and was also adapted into a radio series and movie. Jane Arden was created by writer Monte Barrett and artist Frank Ellis for the Register and Tribune Syndicate. 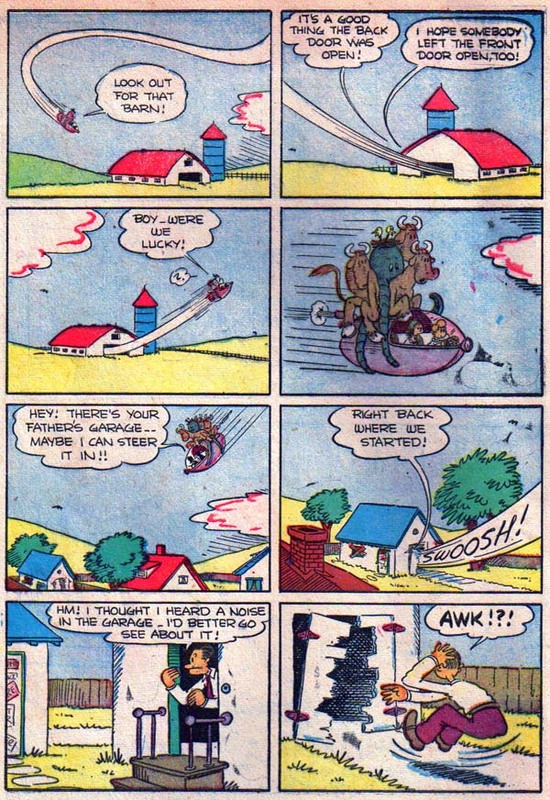 Barrett would continue to write the strip until his death in 1949, and his stories continued to be used until 1952 when Walt Graham assumed the writing duties. Ellis was one of five artists to draw Jane Arden over its 41 year run. The work of Ellis's replacement, Russell E. Ross, is perhaps most identified with the character, as he worked on the strip for twenty years. Ross introduced "Tubby," an office boy sidekick transported from the Slim and Tubby strip he had previously worked. It was also during Ross's stint on the strip that it began to include Jane Arden paper dolls and accompanying outfits for readers to cut out. 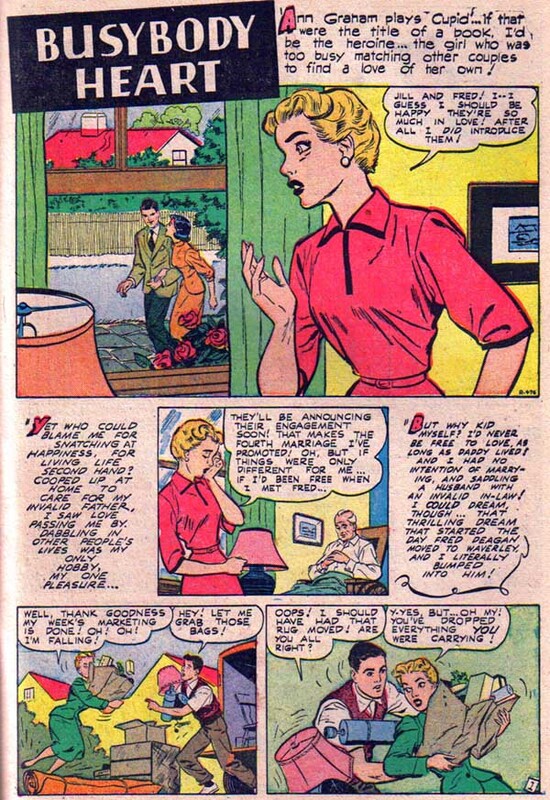 Jane Arden was the first comic strip character to become involved in World War II, when immediately after the outbreak of war in Europe, Barrett and Ross scrapped their current storylines and gave her a war assignment in the fictional neutral kingdom of Anderia, in a strip published September 25, 1939. Pulitzer Prize-winning columnist Mary McGrory credited Jane Arden with instilling her interest in journalism. Jane Arden #1-2 (March, 1948 – June, 1948; St. John)"
Of his real name, Charles Nicholas Cuidera was born in Newark on September 23, 1915. "He attended the Pratt Institute, and graduated in 1939. Afterwards, he started his career at Fox Comics, working under Joe Simon. His first job was working with the early superhero 'Blue Beetle', which he signed with Charles Nicholas. Most of his work at the time was done through Will Eisner's shop. Cuidera moved over to Quality Comics in 1942, where he assisted on the 'Spirit' sections and helped create 'Blackhawk'. Cuidera drew the first eleven stories that ran in Military Comics before heading off to war. He served as a commando in the 36th Infantry Division's 143rd Regiment, while 'Blackhawk' was continued by Reed Crandall. Back in civil life, Cuidera was assigned to a feature called 'Captain Triumph', and also returned on the 'Blackhawk' feature, although this time mainly as inker. Eventually, he became art director at Quality, where he became known as the "Drill Sergeant". In 1956, 'Blackhawk' moved over to DC, and so did Cuidera and his regular penciler Dillin. He inked 'Blackhawk' and other features like 'Hawkman', 'The Brave and the Bold' and the ghost titles for fourteen years. Around 1970, he left the comics field and became involved in city planning in his hometown and scuba diving. The fact that three artists worked under the name Charles Nicholas has led to a lot of confusion among comic historians. Chuck Cuidera is often credited as the creator of 'Blue Beetle', and he also confirmed this at a panel during the 1999 San Diego ComicCon. However, the original creator of the character is most likely Charles Nicholas Wojkoski (1921-1985), who also signed with Charles Nicholas. Even Jack Kirby drew 'Blue Beetle' for a while, and signed it... Charles Nicholas!" The Charles Nicholas confusion isn't the only controversy surrounding Chuck Cuidera. The main contention is that both Will Eisner and Chuck Cuidera claimed to have created Blackhawk. For more on that issue, you can refer to Mark Evanier's transript of a 1999 San Diego Panel discussion featuring both Eisner and Cuidera. For more about Chuck Cuidera, refer to Will Murray's interview with Chuck in CBM # 68 (May 1999) and Jim Amash's interview in Alter Ego # 34 (March 2004). Ken Shannon Synopsis: Ken and Dee-Dee take a day off in the country-side only to drive past a body in a ditch. The body strangely has no shoes nor socks and Ken finds a business card for Nick's Café (Nick Giles proprietor) next to the body. Ken and Dee-Dee go to the café: "Nick's café was a greasy spoon with all the appeal of a cobra pit!" Talking to the waitress, Connie, they find that three guys have the hots for her: Nick, his brother Tommy and Canal-Boat Flanahan. Nick IDs the body as his brother's (hence the business card presence) and offers Ken $5,000 if he finds the murderer. Ken goes to search Nick's office and find a life insurance policy on Tommy with a double-indemnity clause. In the meantime, Dee-Dee gets knocked out in the diner and Connie disappears. While recovering Dee-Dee tells Ken that Canal-Boat Flanahan was in the Navy and the solution clicks in Ken's mind. They rush to the Giles farm to find Nick and his brother Tommy, who is very much still alive, fighting over money and Connie. Tommy wants to leave with her for Mexico immediately but Nick wants to keep her with him and the dough. With the blundering help of Dee-Dee, Ken is able to subdue both of the Giles and rescue Connie. Ken cracked the case when he remembered that in the Navy, canal-boat could refer to someone with large feet. When the brothers upon killing Flanahan who had the same build as Tommy tried to dress him up in Tommy's cloths, they couldn't put Tommy's shoes on Flanahan's 13-size feet which lead Ken to understand the body wasn't Tommy's. All this in 9 pgs. Picto-Crime - So, what was the clew? Nice overview and selection of details, as usual. Also as usual, colorful dialog to sneak into conversations! Who could resist, "Hey! Let me in on the latest hot cob!" and "...the leader of this cokey bunch of Reds...."? Is the Joe Palooka review coming? I wanted to see what you said about the Commie book you bought from me. Thread needs a bump anyway. Just say no to Pre Robin Tecs....sheesh. Popeye has had a long career in the comics starting with Dell, moving on to King then to Charlton to return to Whitman to disappear and reappear for Ocean very briefly and finally for Harvey. Wheeww, that's some tenacity from our gold old sailor but that shouldn't be a surprise! Popeye was as we all know created by Elzie Crisler Segar (December 8, 1894 – October 13, 1938) when he first appeared in his newspaper comic strip "Thimble Theater" in 1929. Segar was born and raised in Chester, Illinois, a small town near the Mississippi River. The son of a handyman, his earliest work experiences included assisting his father in house painting and paper hanging. Skilled at playing drums, he also provided musical accompaniment to films and vaudeville acts in the local theater, where he was eventually given the job of film projectionist. During this time, at age 18, he decided to become a cartoonist. He worked hard on a correspondence course in cartooning from W.L. Evans, of Cleveland, Ohio, in which he had invested $20. He said that after work he "lit up the oil lamps about midnight and worked on the course until 3 a.m."
Segar moved to Chicago where he met Richard Felton Outcault, creator of "The Yellow Kid" and "Buster Brown," and Outcault encouraged him and introduced him at the Chicago Herald. On March 12, 1916 The Herald published Segar's first comic, "Charlie Chaplin's Comedy Capers", which ran for a little over a year. In 1918 he moved on to Hearst's Chicago Evening American where he created "Looping the Loop." Segar married Myrtle Johnson the same year; they would have two children. Managing editor William Curley thought Segar could succeed in New York, so he sent him to King Features Syndicate, where Segar worked for many years. He began by drawing "Thimble Theatre" for the New York Journal. The strip made its debut on December 19, 1919 and featured the characters Olive Oyl, Castor Oyl, and Ham Gravy, who were the comic's leads for about a decade. In January of 1929, when Castor Oyl needed a mariner to navigate his ship to Dice Island, Castor picked up an old salt down by the docks named Popeye. The Popeye character "stole the show" and became the permanent featured character. Some of the other notable characters Segar created include J. Wellington Wimpy and Eugene the Jeep. After a long time of illness, Segar died of a liver disease at the age of 43. First continued by Charles H. "Doc" Winner, the strip was then continued by Segar's assistants, Bela Zaboly and Forrest "Bud" Sagendorf. Sagendorf would continue it for decades until Bobby London took it over from 1986 to 1992 with Hy Heisman taking it over in 1994 (the year Sagendorf died). Popeye's popularity soon led him to cross medium. [Note: the following is from the Toonopedia] In fact, Popeye made his first animated appearance in Betty Boop Meets Popeye the Sailor (1933), one of several cartoons in which the popular Fleischer cartoon star met various comic strip characters, in hopes that some might prove popular enough to merit cartoon series of their own. The trial balloon didn't fly with Henry or The Little King, but it did with Popeye. The same year saw the release of I Yam What I Yam, the first of a long series of animated shorts in which Popeye received top billing. The Fleischer Studio was taken over by Paramount Pictures in 1942, and renamed Famous Studios. Although it never achieved the heights of the Fleischer quality, Famous continued the Popeye series until 1957. In that year, the entire package of 228 cartoons started appearing on television. During the 1960s, more short Popeye cartoons were made as TV originals. These were mass-produced in several animation studios, all over the world, and varied in quality. Many cartoon aficionados consider these to have diluted the product, and hold that the original Fleischer cartoons are the best. The people who provided the voices in Fleischer and Famous Studio cartoons. From left: Jack Mercer (Popeye), Mae Questel (Olive Oyl) and Jackson Beck (Bluto) mug for the camera just before a 1949 recording session. Mercer continued to voice Popeye until his death in 1984. 1) Popeye is "there to quench the national thirst for a comic hero who could stand up, take it, and dish it right back again." For example, on the day after Castor Oyl hires Popeye, Castor states to Popeye that "Sure, you're the whole crew, it's a privilege - twelve men." And Popeye to reply: "All right. Then I want the pay of twelve men." 2) Popeye is not only obviously the salt of the sea but he is also the salt of the earth. He'll stand up for his rights, but he's got a heart as big as a whale. The proof: "after he has literally given the clothes off his back to a poor woman, she wonders: "I'm not accustomed to such kindness. I can't understand all this unless you're crazy." Popeye replies: "When people think that a kind-hearted person is crazy, it ain't saying much for a world which is supposed to be civilized." and 3) Popeye is love. "There is Romeo and Juliet and there is Popeye and Olive Oyl. [...] On February 6, 1929, [we observe this exchange]. Olive: "I never took a look at your face before. Gee, what happened to it, Popeye?" Popeye: "What's the matter with it?" Olive: "Why, it looks like a shipwreck." Now Olive, alone, soliloquizes: "I get a big kick out of kiddin' ol' Popeye. Ha! Ha! I'd hate to go through life with a thing like that on my neck." But Popeye is silently approaching. Is he going to take it? No, a million times no. We see him bending over, closely examining Olive's feet. "Blow me down! Canal boats fer feet on a lady!" Olive, face black with fury, to Captain Oyl: "Throw'im to the Anchovies! You hear me!" When researching who could have drawn the strip in this comic, the Who's Who unfrotunately did not offer any insight on who drew the feature for Dell. The Happy Spring Page - The Happy Spring shrunk Olive and Popeye and grew Sweet Pea who takes over as soon as his size permits him! This is the second Standard Romance entry into our series and the longest running Romance title put out by Standard. The first one covered Intimate Love where I stated that: "[intimate Love] exemplifies perfectly the insipid romance comic from the 50's. For that matter, I would go further and claim that it exemplifies the blandness of Standard as a whole comic publishing enterprise." Our second hint is that out of the 7 I need: Best Romance, Intimate Love, New Romances, Popular Romance, Thrilling Romances, Today's Romance and Western Hearts, I only have 4 and still need those bolded above. That's 43% missing when I'm 90% done with the project. In fact, I wasn't surprised when I looked up where I bought this book from to see that it was from Doug Sulipa, the dealer most likely to help me finish off my obscure Romance needs. As for format, this book parallels Intimate Love as it contains more 1 pagers than most romance books of the era; one pagers with the intent on educating young girls about either proper or acceptable behavior or behavior geared to ensure a shot at popularity. As for the artist line, with the exception of the signed Severin & Elder story, it's anyone's guess as to whom penciled these stories. It's not the only Romance story that Severin & Elder would produce for Standard - in fact, there is another one in March in Western Heart # 10 (the first book I ever purchased for the collection) but one has to be honest and admit that Severin & Elder really couldn’t do Romance. Thankfully(?) Severin's Romance output was limited to a total of 9 stories for Timely / Atlas, 2 for Charlton, 15 for Prize (9 of them for cross-over saddle / range romance type of stories), and about 20 for Standard. I Doubted my Heart Page - As her father goes off at sea, she cuts her hair to regain her own personality and ... he dies swept off his boat Guilt ensues ... for a while until the artist re-declares his flame. One Man Girl ... Splash - Storyline: It's hard living at home with your husband and his father who doesn't accept you as his wife since the mother-in-law is dead and could do no wrong. One Man Girl ... Page - After a while, you decide to confront the old coot ... who drives off in a hissy-fit and runs his car into a ditch. Thank the stars, you rescue him and now he's eating from your hand! My Lesson in Love Splash - Storyline: Isn't it weird that your mother, soon wheelchair-bound due to a car accident likes your beau better than you when all you're trying to do is make more $$$ to be able to take care of her? Another typical story where a woman with a career is not well accepted. Busybody Heart Splash - Does the new neighbor look like a young Peter Parker? Great to see the return of Month in the Life! Be careful so that everyone doesn't insist that the moderators banish you regularly so that you work on this feature more! Just a few quick comments -- Real Life beckons. Any reason to think that it wasn't Sagendorf? I really like these three pages. I think that they show off the similarity to Basil Wolverton's drawing, as well as the influence of the various Popeye artists on R. Crumb. A quick scan of my list says that I can't help out with any of your missing Standard romance issues. Sorry! Somehow this particular issue of Popular Teen-Agers has nothing but saddle romance-type stories. I don't think all issues do and I guess the editor worked a theme into this month's issue. Now, I generally dislike books from Star: the whole bait and switch whereby you discover humdrum interiors behind the flashy and wildly-colored cover by Cole gets old fast enough. Still, when you compare the stories in this mag compared to the blandness displayed in Popular Romance, this book is a winner. It's not high comic book art nor story-telling but the stories are more compelling. The relationships inside are not paper-thin. The writer(s) add some layers of complexity to the yarns: serious conflicts and other events enter into the denouement of the stories. Before I touch on the content, let's review the artistic crew. Beside Cole, two artists signed their work: Norman Nodel and Manny Stallman. First up is Nodel. Norman Nodel was a noted artist and illustrator of children's books and magazines. Nodel began his illustrious career as a field artist in the army, drawing military maps during World War II. After the war, he pursued a successful career as an artist in a variety of styles, notably illustrating a great many issues in the famous 'Classics Illustrated' series in the 1950s. His contributions to this collection include: Covered Wagon, Faust, Invisible Man, Ivanhoe, Jungle Book, Man who Laughs, Moby , Ox-Bow Incident, Rip Van Winkle, Tigers and Traitors, The Virginian and assorted issues in the World Around Us series. Nodel also worked for Ace and Avon in the early '50s notably penciling Avon's one-shot Escape from Devil's Island and worked for Charlton through the late 60's and early 70's as well as for Warren's Creepy and Eerie. During the last twelve years of his life, Mr. Norman Nodel devoted a major amount of his time and energy to illustrating books and magazines specifically for Jewish children, which gave him great pleasure and satisfaction. Norman Nodel worked to the last day of his life. He died on the 25th of February, 2000. In his wonderful and indispensable book, Classics Illustrated, W.B. Jones, Jr., dedicates a chapter to Norman Nodel. This is where we learn that Nodel, while born in Virginia, grew up in St Louis where he performed with the St Louis Opera Chorus and studied the role of Mephistopheles in Faust, a study he put to good use when drawing Faust for Gilberon many years later. After returning from WWII, Nodel worked as art director for an ad agency before going freelance working for Ace, Avon and eventually for Gilberton in 1954. When I was 16, I got my first job. I worked in production for MLJ, which became Archie Comics. I got hired for $12 a week as a production man, doing borders and white-outs, but I wanted to pencil. Harry Shorten was the editor and he became irritated at me. He fired me, then he re-hired me, and after a while, they gave me pencilling. When I finally got so much pencilling that I could no longer do the production work, they hired someone else in my place, and that was Manny Stallman. Giunta and Stallman teamed up and did a lot of work together, much of it for Harvey. I used to see his work, the work Manny was doing, and it was becoming very, very competent. 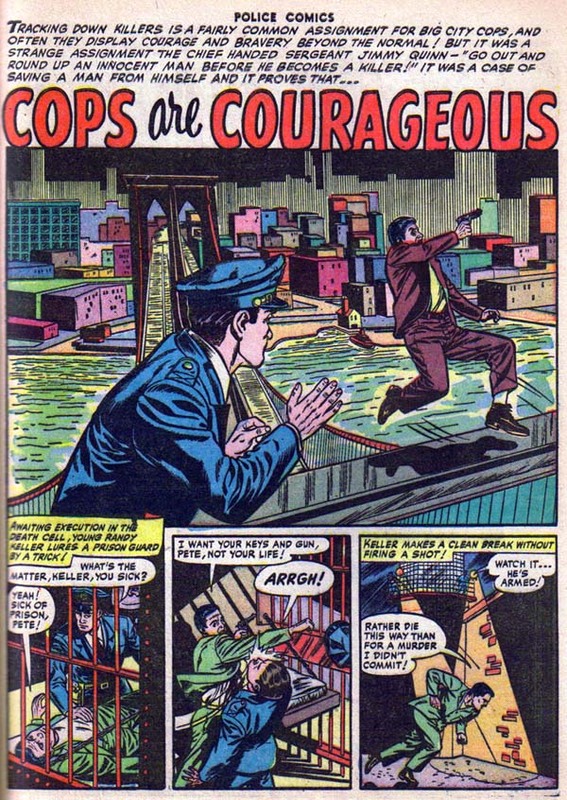 Throughout the forties, he could often be found in Lev Gleason's crime comics — on the original Daredevil, as well as in other books by Prize Comics and Holyoke. Sometimes, he worked with Giunta, sometimes alone. For a few years there, Manny was as an occasional assistant to Will Eisner on The Spirit — a credit he often cited with great pride. In the fifties, he drew crime and horror stories for Atlas, Avon and Harvey, and drew Big Town for DC, along with occasional stories for Strange Adventures, All-American Men of War, Mystery In Space, Our Army At War, Phantom Stranger and the romance titles. Finally, Johnny Giunta and Manny made it over to DC, where they did Big Town. Manny did most of it and his work at first was really quite terrible. But they kept him on it, and something happened. During this time, he was working in advertising, or trying to work in advertising, and I think that had some impact on his comic work. His work became so much better. He really developed an individual approach. His layouts were exciting. His inking, when he inked himself, was very crude but it worked. In the sixties, Manny did several short romance stories for DC that are arresting in how little they look like DC romance stories. At the time, the company was quite rigid about its page layouts. A six-panel page was comprised of six identical-sized square panels, and exceptions to this were few. There was a perception about it that just knocked me out. It was like a combination of Bob Oksner and Harvey Kurtzman — absolutely sensational stuff, with these beautiful figure groupings. He was the only guy there who was making an effort to just break out and be different. I myself had a very slow evolution — it was painful, it was laborious. I still question what it is that I really know with any authority. But Manny had a way of instantly grasping certain fundamentals. His work had a flavor that absolutely got me. In the T.H.U.N.D.E.R. Agents comics of the sixties, he wrote and drew several stories of the Raven in a style so alien that readers had no idea what to make of it. He concurrently did some stories for Archie Goodwin at Creepy Magazine, and the reaction was the same: "I didn't like them at the time but now, as I look back at them, I think they're terrific." This is not only a quote from me, it's a quote from everyone who recalls his work. Manny held the world's indoor record for deferred recognition as a comic book artist. Nobody liked his work when they first saw it; darn near everyone did when they recalled it later. In the mid-sixties, Harry Shorten was putting together this comic line [for Tower Comics] and he brought in artists like Wally Wood and Mike Sekowsky and myself and Manny to do these T.H.U.N.D.E.R. Agents. And all of a sudden, Manny was pencilling and inking like Harvey Kurtzman! I mean, I just couldn't get over it. It was sensational stuff...what Kurtzman might have done if he'd done super-heroes, instantly grasping the essentials of the action. It had a quality of absolute ease that I would envy when I sweated over my pages. Then in the seventies, Manny connected with an ad agency that packaged comic books for advertising purposes, and that became his career. He did several issues of Basky & Robin, a little comic booklet you could get free at your local Baskin-Robbins ice cream parlor, but mostly he did Big Boy. I was astounded when I saw what he was doing in those comics. He was working in what I can only describe as a childlike scrawl. I couldn't believe it was the same artist. Manny drew most of them sitting in front of the TV, working with a small board on his lap. He drew them printed size, working in markers, batting out whole stories with one eye on a Dodgers game. The work was crude and, as Gil says, childlike and I have no idea what I think of it. Manny would send me the books and, when he asked me my opinion, I couldn't bring myself to say anything negative. Manny was so polite, and Manny was so gentle, I usually wound up muttering "Nice work," and hesitantly suggesting he spend a wee bit more time on his lettering. The last five or so years, he was semi-retired, working intermittently on a graphic novel that he hoped would be sold in religious bookstores. I don't think he got very far into it before a stroke ended his career as an artist. Unable to draw, Manny redirected his creative energies to something else — a stand-up comedy act, which he used to entertain patients at hospitals and nursing homes. Manny had an incredible capacity, reaching a level at one point that was more than commendable. His work, when he was at his peak, was just first rate. When I heard he'd died, I had a tremendous sense of loss. He really was a remarkable man." Trust the Man You Love Page - Caught in the middle of a tornado! P.S. : Jack, check out The Story of Money and The Story of Inflation I sent you, they were drawn by Nodel! P.S. : Jack, check out The Story of Money and The Story of Inflation [banks --JPS] I sent you, they were drawn by Nodel! Duly noted. Some nut indexed them for GCD. I didn't realize the Big Boy connection though. More comments about your article later, I hope. D'OH! I skimmed your article way too fast. Stallman makes more sense as a Big Boy artist. Over on timely-atlas, there was a stirring defense of Stallman a few years ago. Doc V assembled a "package" of his best Atlas work and circulated it, and honestly it was distinctive and pretty good. The yahoo group for spillover scans was even named mastall in his honor. The other artist that people love to hate is Matt Fox. I like his woodcut-like work on the right story, but I can imagine the stiffness and quirkiness driving people away. I whined until I got a copy of Doc's Fox "package" and was glad I did!